Spring Field School is an important milestone in the forestry student’s formal education, and is held at the Malcolm Knapp Research Forest. 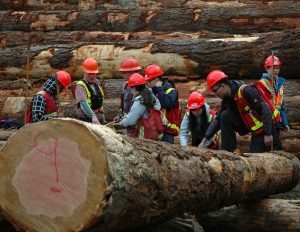 By necessity, most courses are taught in UBC classrooms, however, to truly observe and understand forests we must move the learning environment to the forest. Spring Camp provides this learning environment and it develops the diagnostic and prescriptive skills expected of a professional forester serving a host of clients with diverse values. The course acts as a comprehensive examination/competency test that students must pass before entering their final year of the BSF. This is an opportunity for students to apply their knowledge from course work on integrated problems, and an opportunity for the faculty to test this comprehensive knowledge in the field. Learning to see – everything about the stand, its structure, its origin, the ecosystem, how it will develop over time and how it fits into the whole forest and the social objectives. Developing the imagination – Much of the forester’s work is done in the office, and many critical discussions and debates occur away from the field. By exposing students to a large variety of forest types and stand development stages we can help them conjure up the correct images necessary to understand and contribute to these discussions. This also improves the imagination necessary to understand how a particular site relates to others the student has seen and what will it look like if they follow certain management strategies. Developing essential field skills – With an increasing intake from urban populations, there is a need to ensure that students are comfortable and at home in the woods, and that they conduct themselves safely. 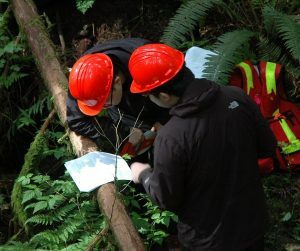 There are a large number of measurement and assessment techniques, such as: basic surveying, mensurational skills, plant and animal identification, and special surveys for silviculture, wildlife and aquatic ecology. Students need to learn the efficient application of these procedures, the difficulty of adhering to the correct procedures under adverse conditions, and a sense of the variability of forests. Realize the limits of our understanding – Students must learn to recognize when they need specialized information or expert help to reach an informed decision. They need to know how to distinguish between field situations in which they are competent to make judgments and situations where critical aspects are beyond their understanding. 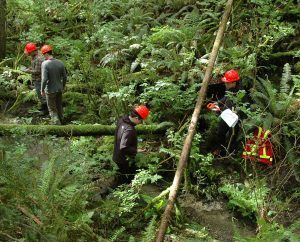 Professional Development – Field school provides opportunities to further develop professional skills and conduct. Students must know their professional responsibilities, to whom they are accountable, accept full responsibility for work submitted, and conduct themselves in a professional manner.